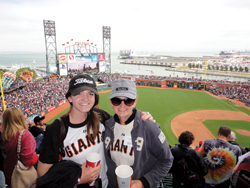 New freshman Annie Bowlsby (top, left) and her mother, Tina, attend the send-off at AT&T Park in San Francisco. 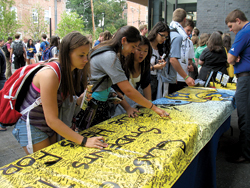 Below, members of the Class of 2015 sign their banner on campus. ALUMNI | While the campus prepared last summer to welcome the Class of 2015, alumni were already making sure the newest Blue Hens felt part of the UD family. New Blue Hens were treated to festive sendoffs from coast to coast in advance of the opening of the fall 2011 semester. Planned by UD’s regional alumni clubs, the Office of Alumni Relations and the Office of Admissions, sendoffs were held in Baltimore; Washington, D.C.; Demarest, N.J.; Hermosa Beach, Calif.; San Francisco; Berwyn and Reading, Pa.; and Weston, Fla., entertaining more than 130 alumni, students and parents. Anne Barretta ’83, a UD Alumni Association (UDAA) board member and Volunteer Admissions Support Team member, joined Richard Greenberg ’77 and his wife, Teresa, to host the event in New Jersey. Alumni also connected with students when they arrived in Newark. Members of the Class of 2015 had the opportunity to sign their class banner, sponsored by the UDAA, at several events during their first few days on campus. Carle Foster ’86, chair of the UDAA outreach committee who attended the signing events, says he was pleased to see so many students getting involved with the UD community. “I was so happy to see the enthusiasm shown by the Class of 2015 regarding signing their class banner,” Foster says. “It’s important for all students to understand that being a Blue Hen is about more than just the four years you spend on campus.” Attending the events with him was his wife, Kathy Riley Foster ’88. Their daughter, Allie, is a member of the Class of 2015, studying athletic training. Lauren Simione ’95, assistant director of alumni relations, estimated that more than 2,500 freshmen signed the banner. The banner will be displayed in the student centers throughout this school year, at class events over the course of the next four years, at Commencement in 2015 and at class reunions. The offices of Alumni Relations and Annual Giving helped encourage UD spirit during National College Colors Day on Sept. 2 by giving out “blue” and “gold” lemonade and class stickers to students who spun a UD Trivia Wheel. Finally, Alumni Relations and the Student Alumni Ambassadors hosted their first “Make and Take” event, which gave students the chance to take a break and show off their artistic talents by decorating picture frames and note cubes with UD materials while relaxing with friends.